The Alsatian-born American theoretical physicist Hans Albrecht Bethe (born 1906), prolific and creative contributor to several vital fields of nuclear physics, discovered the mechanism of energy production by stars (including the sun). 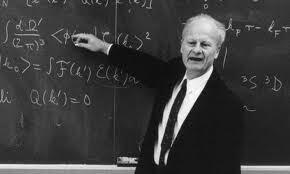 Hans Bethe was born in Strasbourg, Alsace-Lorraine--(now part of France)--on July 2, 1906, to Albrecht Theodore Bethe, a physiologist, and Anna Kuhn Bethe. At the age of 22 he earned his doctorate at the University of Munich and was given an assistantship at the Institute of Theoretical Physics of the University of Frankfurt. After a year he transferred to the Technische Hochschule in Stuttgart and then for three years was privatdozent--unsalaried lecturer--in physics at the University of Tübingen. He worked at Cambridge University and in Rome in 1930-1931 and then returned to Tübingen as an assistant professor. After Hitler came to power, Bethe fled first to England and then to the United States, where Cornell University welcomed him. At age 31 he was elevated to the post of Wendell Anderson professor of physics. In 1939 he married Rose Ewald, the daughter of Paul Peter Ewald, a professor of physics in Munich. They had a son and a daughter. In 1939 Bethe published a paper, "Energy Production in Stars," in which he advanced a theory of stellar fuel. He discovered that, by a series of transformations, carbon, acting as a catalyst, changes four atoms of hydrogen into an atom of helium of atomic weight four. During these transformations the carbon is rejuvenated and there is a very small loss of mass which is converted into the enormous amount of energy which stokes the stars. For this achievement as well as for his many important contributions to the theory of nuclear reactions, Bethe was awarded the Nobel Prize in physics in 1967. Bethe published the first theory of electron-positron pair creation and an improved theory of how charged particles interact. The latter is a key to the determination of the amount of radiation shielding required by nuclear reactors and by astronauts in space. It is also critical to the understanding of cosmic-ray phenomena, the design of experiments in high-energy nuclear physics, the theory of the structure of metals, the shock-wave theory, the scattering of mesons, and the energy levels of the hydrogen atom. In 1941 Bethe became a naturalized American citizen, and between 1943 and 1946 he worked as head of the Division of Theoretical Physics at the Los Alamos Scientific Laboratories, where the first nuclear bomb was being manufactured. His assignment was to determine the amount of uranium or plutonium that would be necessary to produce a nuclear explosion and to calculate the total energy that might be released in such an explosion. Bethe was also responsible for a group which had to determine the mechanism of assembling an atom bomb implosion; that is by bringing together, in a split second, a spherical ball of either uranium or plutonium by means of a high explosive. After his work at Los Alamos, Bethe returned to his teaching position at Cornell University. He retired from Cornell in 1975 but maintains an office there and continues to serve as a lecturer and consultant. In addition to his academic work, Bethe was also active in the disarmament movement and sought to educate the public about the destructive power of nuclear weapons. He remains committed to this cause. He sent a letter to President Clinton in 1997, calling for a complete ban on nuclear testing. On July 2, 1996--Bethe's ninetieth birthday--it was announced that the American Physical Society would begin awarding the Bethe Prize for contributions to the field of physics.